Bloodstained is making sure to follow the standard Kickstarter progression path. It goes: put up campaign, become massively successful, expand project scope, realise you need more developers and finally delay the game. It’s essentially inevitable, because developers want to make the best thing they can with the opportunity they’re offered. Either they underestimate the workload of the initial ideas or decide they can do more – and here we are. 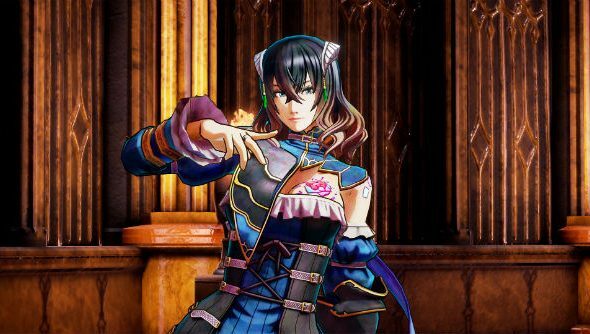 Bloodstained will now release in 2018. Try some of these excellent indie games while you wait. The move was explained in a Kickstarter update with the video above. The dev team apologises for the delay, but explains that meeting their quality standards is going to require more team members and a lot more work. They’re hiring now, grabbing an entire new team to work on the main production, but it means a delay. Beyond 2018 not a lot of further details were given. They’re aiming for the first half, but if you’ve followed many Kickstarters before, that’s no guarantee. Still, setting their release goal so far out at least indicates realism in the time these things take – four year delays only really happen when you think you can get it all done in three months in the first place.